In Biella Italy, Cristiano Creminelli runs his family business, Salumifico di Vigliano. From as far back as the 1600s the Creminellis have created artisan meat products using time-honored traditions and the finest ingredients. In 2004 Chris Bowler, as a member of the U.S. Olympic Committee, moved to Italy in anticipation of the 2006 Torino games. He met Cristiano there and purchased some of his meat for the Olympic house. After the Olympics he and Cristino developed a plan to bring his products to the US. They made some exploratory trips and looked for just the right climate. They picked Salt Lake because the climate here is similar to Bellia and the weather is perfect for curing the meats. Their goal was to combine the best of Italian handcrafted traditions with U.S. heritage quality meats and other ingredients. Cristiano started out in the basement of Tony Caputo’s making small batch salami and sausages. They introduced their creations at the Farmers Market across the street and were soon able to move to a facility of their own. Brian Seethaler, director of marketing for Creminelli Fine Meats, says that from 2009 to the present the company “took off.” They now have their own 55,000 – square foot facility. Some of their offerings are prosciutto, coppa, mocetta, mortadella and various handcrafted salamis. The ingredients are key and it starts with the meat. Creminelli purchases meat from providers that adhere to very vigorous animal welfare standards and that use certified vegetarian diets and no antibiotics and hormones. 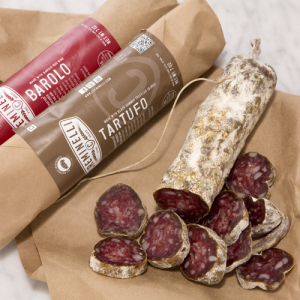 One of the key differences in the meats cured by Creminelli is that they don’t use nitrates. They cure their meat naturally with time and starter cultures. They also use organic spices. Time, temperature and humidity are all strictly controlled. Because of the process they use the salamis are shelf stable – they might dry out over time, but they will never go bad. Creminelli Fine Meats still has a booth at the Farmers Market, but shoppers can also find their products locally at Liberty Heights Fresh, Harmons and Whole Foods. They also distribute in markets across the country and many restaurants serve Creminelli meats. For those who appreciate quality and taste, enjoying a Creminelli salami is like taking a trip to Italy without leaving home.